Low voltage wiring is the wiring for audio, video, telephone, intercom, data, alarm system, weather station, HVAC, and generally any wiring for things using less than 24 volts. Multimedia Tech understands that an architect produces very detailed floor plans in order to turn an idea into a build-able home. Much collaboration is needed between the architect and client to ensure that the end result is what was envisioned. Likewise, your home’s audio and video systems need to be designed and engineered well in advance of actual construction and should be reflected on a detailed low-voltage wiring plan. Discussing your home theater installation, TV installations, audio & video, computer network solutions, lighting control system, and home automation needs with Multimedia Tech early in the home design phase results in necessary coordination between your architect, interior designer, builder, and all affected subcontractors. Costly change orders are avoided, and the end result is a smoother construction process and greatly improved finished aesthetics. 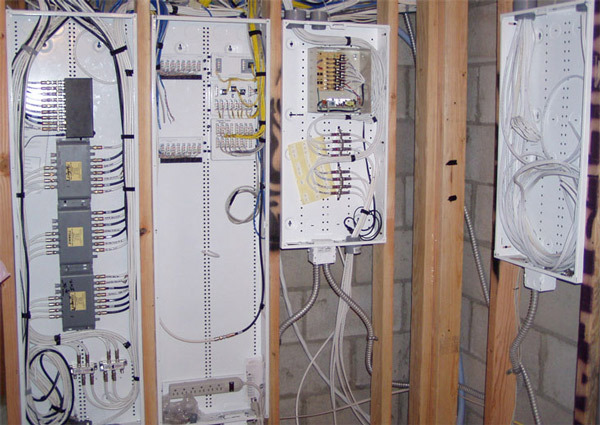 For clients that are building and have new and open construction or those with existing homes, we can perform basic wiring for phone and cable, whole house structured wiring for entertainment and security system installations or upgrades of existing systems. We pre-wire for home audio, surround sound, home theater, outdoor music, intercom systems, HD cable TV, satellite, cctv security camera, telephone, and computer networking. In addition to the wiring, we terminate and install jacks for phone, computer, satellite, and cable. In our current age of wireless technology, the wiring infrastructure of a home or business is more important than ever. Phone, data, cable, audio, video, security, control…To meet today’s and tomorrow’s technology needs, homes require wiring that supports a robust network for automation and communication. Something as seemingly untethered as your WiFi network still requires a well thought out, high-bandwidth wiring layout to create a seamless network. The distribution of audio and video throughout a home still requires high quality wiring to guarantee that all of your technology reliably communicates within your home and to the outside world.